Planning your testing effort for the next project: How much time do you have? How many people do you have? _How_ big was that scope again? As testing is virtually always constrained with not enough time, not enough people, not enough infrastructure, etc it is vital that the testing effort is able to prioritize what is critical and what is not so the scarce resources can be applied in the most valuable manner possible. New functionality is where the excitement is, and definitely where there is a high probability of defects. And in the face of tight budgets and schedules, even new functionality testing is often short-changed. But is it really the only place of high risk? How many times has the code been changed and something seemed to break somewhere else? What if the impact is a data integrity issue? What if the collateral damage is deep into a different business process? What if performance of key tasks degrades after making a “small” change in a supposedly unrelated area of the system? Regression testing is intended to uncover such errors in areas of the system that were previously considered to be working by re-testing the system after changes have been made (eg: defect fixes or new functionality). Regression testing is typically a challenge on any project because of ever-present time and resource constraints. However the neglect of regression testing builds a potential for undetected failure into the system. This potential typically only increases as time passes. The following are some more specific reasons why regression testing is often left behind in the project plan. One of the crucial components to being “smart” in a constrained situation is to be able to correctly decide on or select which things are “must-haves”, which are “should-haves” and which are “nice-to-haves”. For any testing effort on a maturing system, a regression testing approach is definitely a “must-have” in order to address that risk of collateral damage or service degradation. At the same time, you should not expect to have to rerun all the tests you did when the functionality was new. 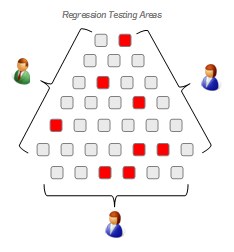 Thoughtfully sample the system functionality and associated tests for areas where a regression would matter most. If/when such issues are found deeper testing can take place at that point. If you already have comprehensive, well-defined, documented tests, then deliberately de-select less strategic tests that you used when testing new functionality. Your pared-down regression test suite will help you mitigate the risk of missing things while you continue to put focus on the new development in your testing effort. It may feel a bit painful at first to “throw-away” some of those tests, but in truth you are really just setting them aside and focusing on the high priority tests that make the most business sense to re-execute on a regular basis. Even with thoughtful consideration of the tests for the regression suite, the number of tests and the time it can take to execute them can be significant. To help reduce the time for execution as well as reduce maintenance of test data and set-up/configuration costs, we can turn to test automation. Is the risk tolerance of your project and organization so high that you can really afford not to have an efficient regression testing solution? Reduce the level of risk in your system and organization by including a regression testing solution as part of your overall test strategy for any significant release. Design your regression test suite in such a way that you are able to perform different levels of regression testing while also reducing resource and turnaround requirements. If you carefully feed and care for your regression test suite you will reap the benefit of continually increasing confidence in the stability and quality of your system through maximized test coverage and ease of execution within your constraints. This entry was posted in All, Business of Testing, Planning for Quality, Test Planning & Strategy and tagged prioritization, regression testing, software testing. Bookmark the permalink.